Liked it better than I thought I would!!!!! - Lori's Little House of Reviews. Liked it better than I thought I would!!!!! 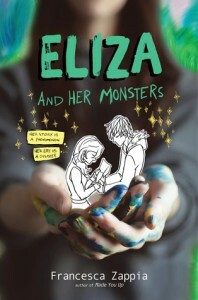 I really liked Eliza and her monsters a lot more than I thought I would. I really just bought the ebook because I heard a lot of readers talking about how much they really loved the book. So when I found out yesterday that it was on sell for $ 2.99, I thought to myself why not buy it. WoW I really felt bad for Eliza when people found out who she was, and then all the feelings she went through. I can understand her panic attacks, because I get them sometimes, and I feel like I can't breathe and like I am going to pass out. I really didn't start getting into the story until she meet Wallace. Lets talk about Wallace, boy when he told his story about why he is the way he is, boy my heart about broke for him. I did get a little upset at Wallace towards the end, but only for a few seconds, then I was in love with him again. The ending had me almost in tears, at that is what made it a 4* review and not a 3* review. I also have to say how much I loved Eliza's brothers, they were just to cute. I really also loved her two friends that are her online friends. I loved how they reacted after the reveal in regards to trying to calm things down. So I am so super glad I gave this book a chance.